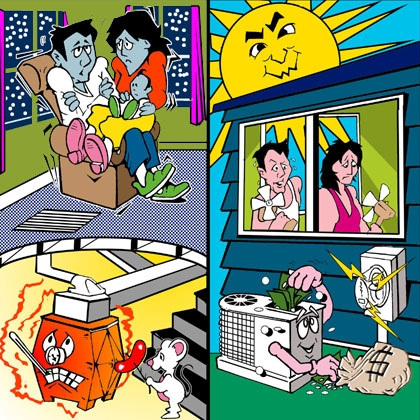 Energy Saving Tips for Home Energy Efficiency - Save Energy Today! All of us can take steps, from the simple to the drastic, to spend less money on energy, make our homes more comfortable, and lower our households’ impact on our environment. Small behavioral changes can have large paybacks even though those changes may be free. Larger undertakings can increase the value, durability, and longevity of our homes while also saving energy dollars. Below are some of the simple things you can do now to get started. Use the links to the left to access more extensive energy saving tips. The Homeowners Handbook to Energy Efficiencyis also a great source of information. Use the search box to find a specific item of interest. Lower Thermostat temperature. Your thermostat setting determines the amount of money you’ll pay for heating and cooling. A ten-degree setback at night during the heating season will save you 6 to 12 percent. Set the temperature back again when the family leaves the home for work and school. Likewise setting the thermostat higher during the cooling season will reduce your air conditioning costs. Control these setbacks manually or buy and install a programmable thermostat. Set your hot water heater thermostat so the water temperature at the fixtures is 120°F. See Reducing Water Heating Costs. Set your refrigerator temperature between 30°-40°. Set your freezer temperature to 0°-10°. If your refrigerator has a Energy Saver switch, turn it on. Replace your refrigerator if it was manufactured before 1990. Clean the lint out of your clothes-dryer vent and consider re-piping the vent in rigid metal to reduce airflow resistance. Better yet use an outdoor clothesline as weather permits and dry your clothes for free . Maintain a clean furnace filter and have your furnace serviced periodically. You can save a lot of money by heating only a portion of your home rather than the whole house when just one or two family members are at home. See Zoning Your Home. Replace your incandescent lights with compact fluorescent bulbs or new fluorescent fixtures. See CFL’s. My fiance and I have just moved into a new home and we want to look into getting lower electric rates. Any tips to help us save on our bills would be greatly appreciated. I will be sure to replace the incandescent lights with fluorescent for less energy used. It helped a lot when you mentioned how lowering the temperature of your thermostat can help you save energy and keep your heating system well maintained. I understand that doing some research and consult with a professional can also help you with your heating system. Personally, I would also want to take into consideration the type of unit I have in order to find the best way to care for it. This is a great article.I am really fond of energy saving and renewal energy. Also please check this out.Solar and Wind turbine setup totally for complete beginners,very very helpful. I didn’t know that larger undertakings can increase the value, durability, and longevity of our homes while also saving energy dollars. My dad wants to save money this summer. My mom suggested checking electricity rates and shared this article with him.